The musicals at Tuacahn for 2017 have been announced! I am personally most excited for Mamma Mia! I am feeling a girls night coming on! Get your tickets early! 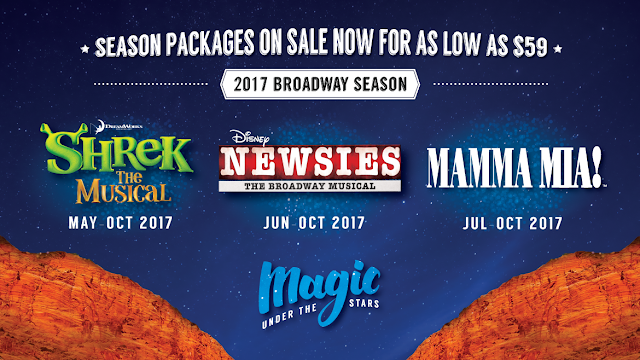 Season packages are a great way to get the most for your buck! You can also get discounts and access to pre-sales for their concerts! Here is an overview of each musical. Based off the movie this is about an ogre who lives alone in a swamp. His home is overtaken by fairytale creatures who have been kicked out of their homes by Lord Farquaad. Shrek wants his home back so he makes a deal with Lord Farquaad. If Shrek rescues Princess Fiona he will give the fairytale creatures their home back leaving Shrek in peace in the swamp. Of course there is a twist in the story! Shrek begins to fall in love with Fiona...How will the story end? Seize the day! This is a musical set in New York City and based on the newsboy strike of 1899. Sophie is determined to learn who her father is before her wedding day! She invites 3 men that could possibly be the father she's looking for! Which one will it be? This is a funny, heartwarming musical filled with music of Abba. To order tickets call Tuacahn's box office at (435) 652-3300 or (800) 746-9882. Or you can purchase them on their website.